Come stroll our shaded paths, enjoy the beauty of the flowers, spend a moment in quiet reflection and escape into the Land of the Rising Sun. Nestled in a pine grove near the Sam Houston Monument in Hermann Park, you’ll find an island of serenity known as the Japanese Garden. Designed by world-renowned Japanese landscape architect Ken Nakajima, the garden was built to symbolize the friendship between Japan and the United States, and to recognize Houston’s thriving Japanese community. The Japanese Garden in Hermann Park is built in the Daimyo Style, a traditional design that dates back to the 17th, 18th, and 19th century stroll gardens. Like most stroll gardens, this five-acre oasis is designed around a sequence of landscape elements, which come together to create a work of living art. It exemplifies the philosophical and artistic attitude of the designer and combines elegant simplicity with traditional design to fit in harmony with the park's topography and Texas roots. When you step through Nagayamon (Japanese for gate), you begin your tranquil journey into the Land of the Rising Sun. In Japan, this type of gate, with rooms on both sides, might be found at the entrance of mansions for high-ranking samurai. In Houston, it provides an entrance into another world. Flanked by pine and oak trees, the gate is a good example of creating new value with existing materials. At the entrance to the garden, a Yukimi style stone lantern greets you, symbolically lighting the way into and through the garden. The stone lantern is a gift from Houston’s sister city, Chiba City, Japan. Winding stone paths meander past crepe myrtles, azaleas, Japanese maples, dogwoods, peach and cherry trees, as well as other flowering foliage. A small arbor is visible in the distance beyond the bridge and through a grove of pine trees. The Japanese iris outlining the arbor beckon you on as you wind your way towards the center of the garden and the Azumaya or teahouse. While small in size, the teahouse floor plan is a traditional design used for Japanese tea ceremonies. The Commemorative Association donated the teahouse for the World Exposition through the initiative of former Prime Minister Toshiki Kaifu on his visit to Houston during the 1990 Economic Summit. 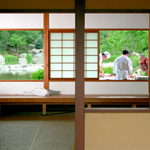 The teahouse was originally built and constructed in Japan utilizing traditional Japanese materials. Japanese laborers in Houston then reassembled the teahouse in the garden. The teahouse's pillars are made of “Hinoki,” a cypress tree indigenous to Japan and famous for its fine grain. The round crossbeams below the ceiling are called “Kitayama-sugi,” which is a special cedar tree from Kyoto. This carefully polished timber is a highly prized and expensive commodity in Japan. The assembly method for supporting the roof is as unique to Japan as the woods it is constructed from. The waterfall created by the granite cascade splashes into a small pond that connects with the stream that winds along the garden's stone pathway. 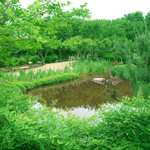 Construction on the Japanese Garden was begun on March 26, 1991. A year and two months later, it was dedicated on May 4, 1992. March 1 - October 31: 9:00 a.m. – 6:00 p.m.
November 1 - February 28: 9:00 a.m. – 5:00 p.m.